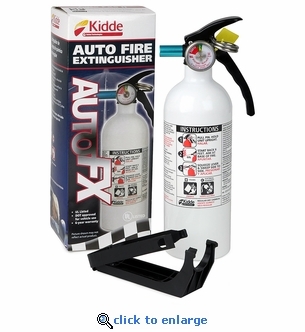 The Kidde Auto FX5 II Fire Extinguisher is a 5B:C dry chemical fire extinguisher rated for flammable liquid fires (Class B) and electrical fires (Class C) involving electronic equipment and appliances. This small and easy to handle fire extinguisher is an ideal choice for your car, kitchen, garage and other vehicles. Only 11.5 inches tall, it's easy to store under kitchen cabinets or in your car for an emergency. Just pull the pin, aim it at the base of the fire and squeeze the lever to release the fire extinguishing agent. Mounting and use instructions included. This one time use disposable fire extinguisher must be replaced 12 years from manufacture year.